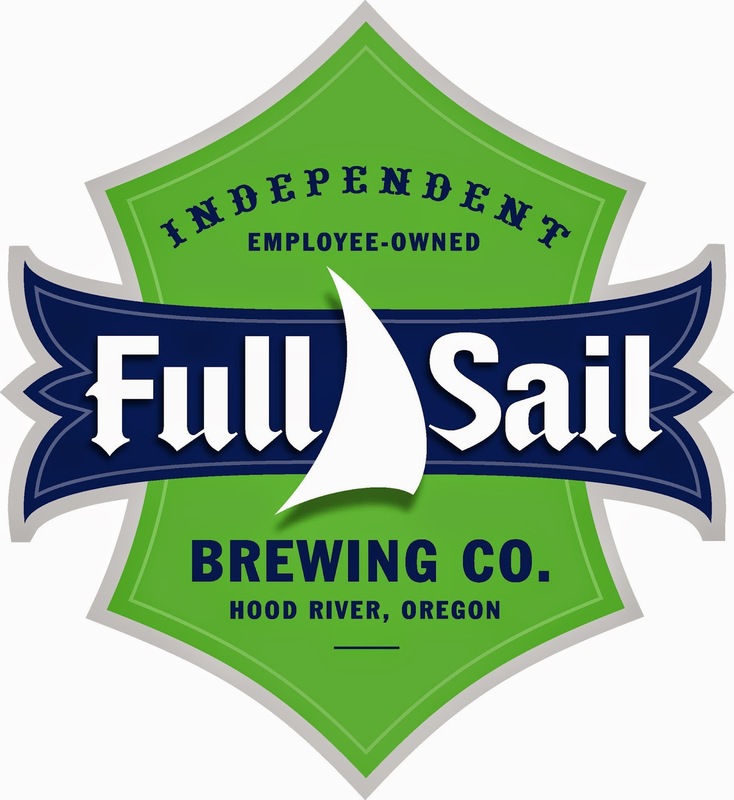 Full Sail is one of the oldest and most respected craft brands in the land. Founded as Hood River Brewing in 1987, the brewery made an instant splash by bottling its beer. 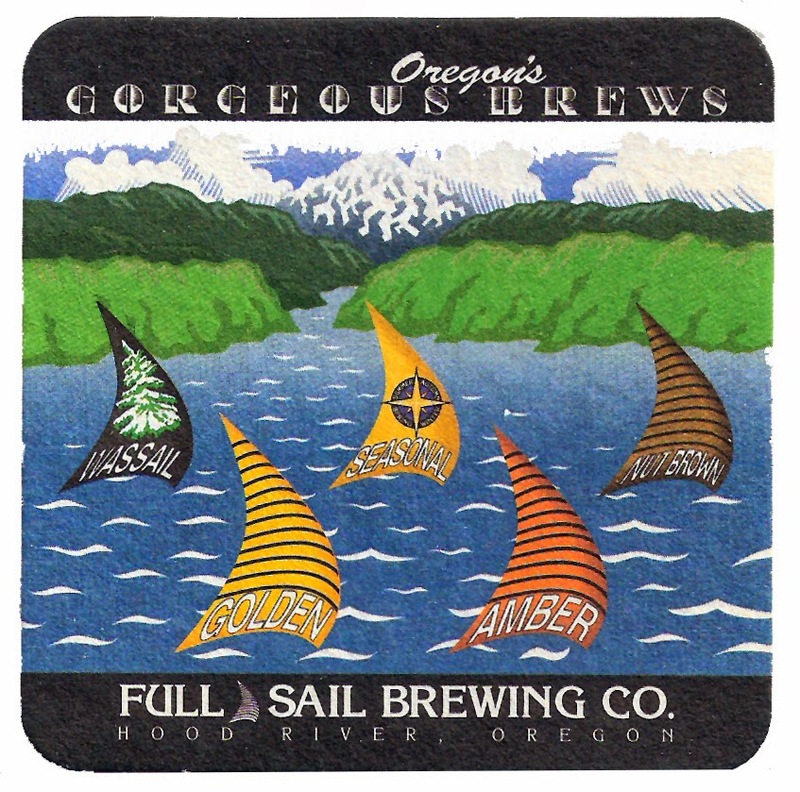 They were the first Oregon craft brewery to do so, after the failed Cartwright..which made bottling seem like a sketchy, treacherous prospect. The bottling scheme, and I'll get back to how and why it happened, is a good example of how the company has operated for 27 years. They make a plan and follow through with it. Full Sail, which has been employee-owned since 1999, operates differently than most breweries. "Our ownership is so different," said founder and CEO, Irene Firmat. "When your owners are your employees, you have a long-term perspective. We don't have an investment group in San Francisco or New York pushing us for quarterly returns or telling us to do things that don't fit with our mission." What Full Sail does have in the minds of many beer geeks is a collection of tired, worn out brands that don't seem nearly as relevant as they once were. 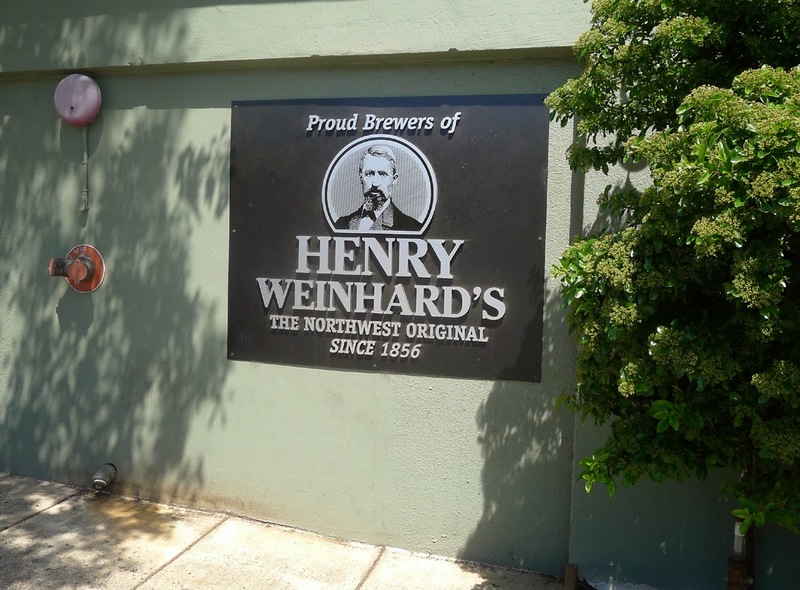 On top of that, the financial boost provided via a contract to brew several Henry Weinhard brands for MillerCoors beginning in 2003 ended in 2013. There's more. The recent hiring of Andy Krakauer as vice president of sales, and Jim Brady, as Pacific Northwest region sales manager, suggest Full Sail may be looking for a new strategic direction. Krakauer previously held a high profile position MillerCoors, while Brady was a sales director at AB-InBev. Could Full Sail be in trouble? Are these desperate times in Hood River? It's a question worth asking. I talked to Firmat about the past, present and future at Full Sail. 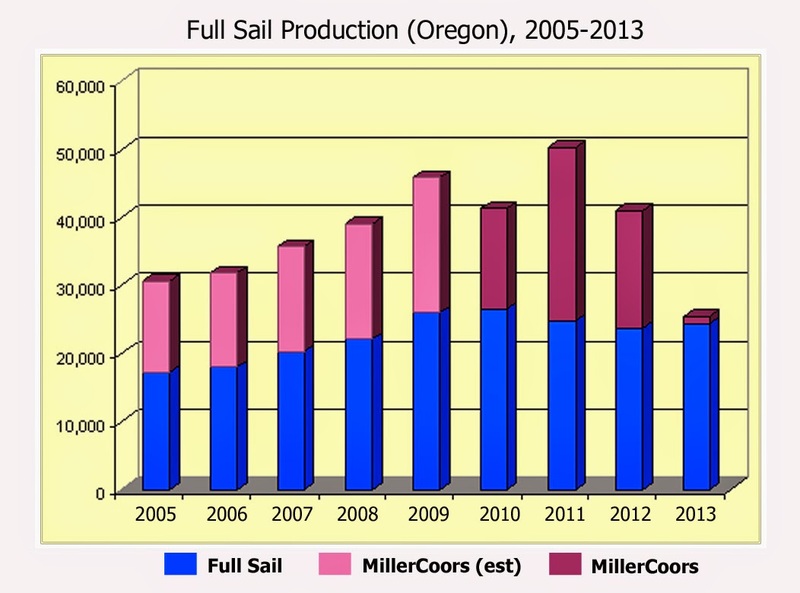 Firmat reckons MillerCoors production at Full Sail peaked at around 50,000 barrels in the sixth or seventh year of the contract. My graphic suggests 2011 was the peak year, but that may be misleading since these are Oregon-only numbers. Regardless, there was a lot of MC beer coming out of Hood River. And a fair amount of cash coming in. "As soon as we lost the contract, people wondered, 'Gosh, is Full Sail going to be okay? '” Firmat said. "I can understand why they wondered, but you really have to look at what we did when we had the contract. We made some huge investments for the future." Among other things, she's talking about the purchase of a mash filter that saves a million gallons of water a year. They renovated their pub, which hosts more than 220,000 visitors every year. They also invested in additional fermentation capacity and and bought an adjacent building, which enables then to do things they previously couldn't. "If you want to be independent and you want to be able to pursue your passion without compromise, you need to be financially sound," said Firmat. "You can’t have your back against the wall worrying about whether you’re going to be able to pay your bills. The Miller contract did that for us. "If you take a look at all the lagers we’re able to experiment with now, that’s quite an investment in time. There are things we can do today because we have so little debt. I think creativity and quality are nurtured in an environment that is financially healthy, sound. We strive for that and we're fine." 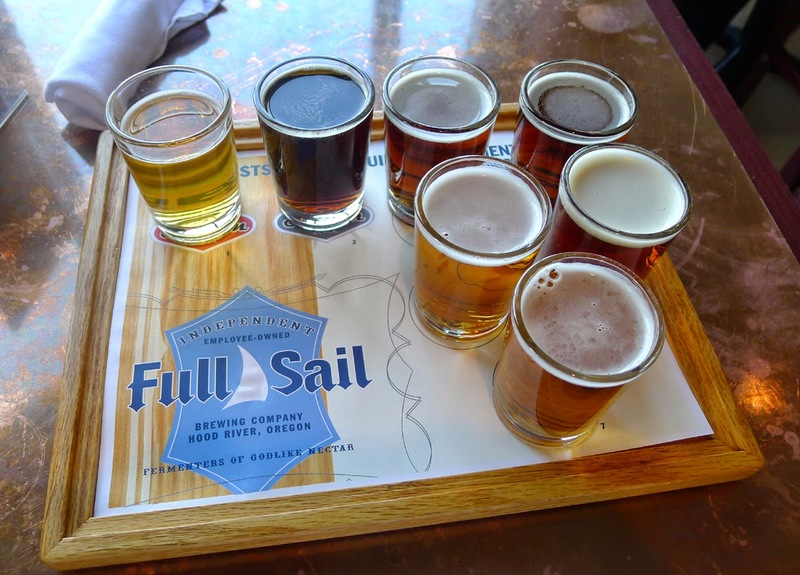 Full Sail markets its beer in 31 states, although they are tightly focused on fewer than that. In terms of creating interesting beers, the brewing philosophy is grounded in the basic brewers pallet of hops, barley, water and yeast. "We believe strongly in the four ingredients," Firmat said. "It’s endless what you can do with hops, barley, water and yeast. We like the discipline of that. We’re interested in creating beers that fit with the culture of people sitting around drinking a few beers. We don't believe good beer is about geeking out on IBUs or who brewed a beer or beers than only a select few have access to." That approach means Full Sail beers are often seen as out-of-touch with contemporary trends. The proliferation of fruit beers, sour beers, super hoppy beers, barrel-aged beers, etc, has produced a scene in which tastes are eclectic and shifty. Whether that culture is here to say is an open question and a subject for future discussion here. But Full Sail's path is clear. "We've been in business for 27 years and there’s always been something new and trendy," said Firmat. "And we've not chased it. It’s been wheat beers, it’s been sour beers, it's been hoppy beers. You name it. Weird, extreme flavors. So many different fads. For us, the long view is all about brewing consistent, memorable beers that people can enjoy for what they are." That isn't to suggest Full Sail is frozen in time. They brewed and marketed an IPA in 1991. It didn't sell. Too early. They got immersed in barrel-aging more than 15 years ago. They were among the first Oregon craft brewers to produce fresh hop beers. Time does not stand still in Hood River. "Innovation is great," Firmat said. "But chasing something that’s in one moment and out the next isn't appealing to us. Right now, our Amber is growing by double digits. We see people coming back to beers they believe in and trust…consistency and a flavor profile that is sophisticated and elegant. There will always be extremes. We just don’t think that's what should drive things." The Session brand, now on the market eight years, might be one of the best examples of Full Sail's grand plan. 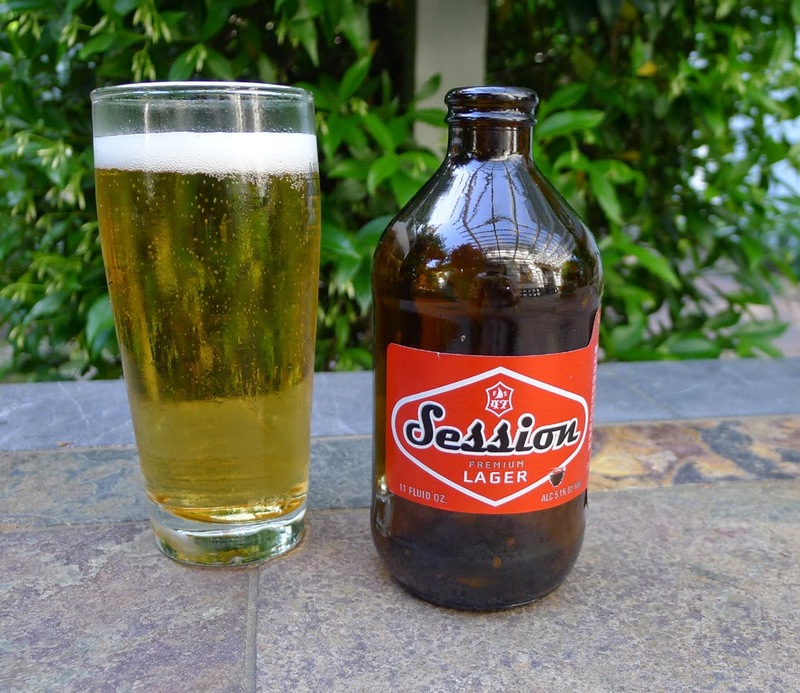 There's nothing wacky or trendy about Session, which comes in several basic flavors. Instead, it represents a solid, value-oriented approach to beer. And it has been a huge hit. It's funny, Firmat said. "A lot of people are talking about sessionable beers right now. But we've been living and breathing that since 2005. 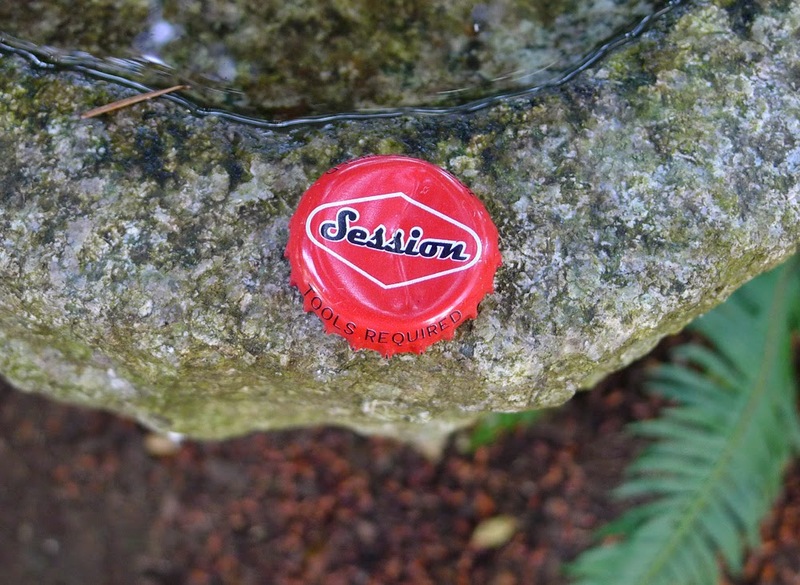 Session is a quality product sold at a decent price. We work hard at that. We've invested in efficiencies that make it possible because we think customers should get good value off the shelf." The conservative, traditional approach means you won't often find Full Sail beers on tap in taprooms and bars where trendy, extreme beers are king. That's largely a choice and you can certainly question if it's a wise one. Firmat and Full Sail prefer to see the beer game as a marathon, not a sprint. They have 27 years of success on their side. Full Sail's recent hires are probably best viewed in the context of the culture. This is not the kind of company that would bring in people to turn the place upside down and shift the overall mission in newfangled ways. Flashy personas and gimmicks don't have much traction here. "When you look at the investment we’re making in Andy and Jim, it fits in with our view of things," Firmat said. "Given our long-term focus, our message isn't always the easiest to get across. We need people who are strong and know how to execute in the increasingly cluttered environment of craft beer. Andy and Jim have those attributes." Krakauer, who started last week, becomes just the fourth VP of sales in Full Sail's history. The Oregon native has a lengthy resume that includes stints at MillerCoors and Anheuser-Busch. He has expertise in strategic business development and, significantly, led development of the SmartSKU program at MillerCoors. Brady brings 20 years of sales excellence at AB. "Andy and Jim completely fit the mold we’re looking for," said Firmat. "They're smart and they understand how technology is affecting beer, beverage and consumer products. They also understand the need to analyze and understand data in today's marketplace. You can’t underestimate how important it is to know what’s going on with your brands at all times." Inquiring minds may fairly wonder how a couple of guys from big beer fit with the Full Sail mission. It isn't entirely clear. On the surface, these hires appear to be as much about fit and feel as they are about any particular area of expertise. That may turn out to be a mirage. Time will tell. "One of the things I take pride in is the positive culture we have here," said Firmat. "People come to work because they have to, but we respect and support each other. It’s everyone’s job, particularly mine, to help foster that. Andy and Jim understand that culture and the importance of being part of a team effort. That's a big win for us." Any kind of significant rebranding or repositioning of Full Sail's brands appears unlikely. They evidently have some things in the pipeline, but whatever changes or additions are coming will fit with what they're all about. It's easy to argue for a more aggressive approach in today's marketplace. But, again, Full Sail's strategy is what it is. They own it and they believe in it. Getting back to the early days, as promised, Full Sail's founders originally planned to open in Portland. They had a plan in motion as Bridgeport and Widmer were ramping up. There was no way to get bank loans for a brewery in those days, and it took them three years to raise the money they needed from friends and family. In the interim, Portland Brewing opened in 1986. Firmat and her partners figured Portland would not support four breweries. Little did they know what was coming. So they looked at Hood River, which was economically decimated at the time. They liked the potential of the place and chose to open there. In fact, the brewery has been part of bringing the town back to life. Today, Hood River is a destination for folks looking to enjoy its charms in many forms. It's tempting to think Full Sail launched the bottling program because of its relatively remote location. They would, after all, need bottled beer to gain easy access to Portland and other not-so-nearby markets. As often happens, the reality runs somewhat counter to perceptions. "Bottling was part of our business plan from the beginning," Firmat said. "Even when we thought we were going to open in Portland, we expected to bottle our beer. We would have been scared out of our wits if we'd known what bottling truly meant. Fortunately, we were young and had no idea what we were doing." Just to close the loop, the plan to bottle evolved out of Firmat's background in retail at Meier & Frank. She figured people should be able to drink good beer at home and share it with friends at parties and gatherings. Bottling took some effort and know-how, but it was a huge success for the reasons she put forth. It also positioned Full Sail, the first to bottle, as a leader. In the end, the bottling program stands as a nice example of how Full Sail operates. They make decisions for their own reasons and they see them through. Their path has often been unorthodox, but never trendy. Like it or not, that's who they are and, likely, who they will be going forward. They have some history on their side. Smooth and steady sailing at Full Sail! Nice post Pete.